Your Grill MUST be “at least”10 feet away from any structure, trees, bushes, tents, decking, gazebo cars, and dumpsters, plus any overhangs from these hazards. Always grill on a flat, stable surface – never on a deck or in a dry field. Do not wear loose clothing that could contact the fire, such as hanging shirt-tails or dangling strings. Have the right tools for cooking such as long-handle utensils and good oven mitts. Choose a safe grilling location away from children’s play areas and walk ways. If adults are consuming alcohol, keep them away from the grill. Never grill inside or in semi-enclosed areas. Why? Because of potential carbon monoxide poisoning. Never leave a grill unattended! Read the owner’s manual and operating instructions carefully. Use the exact type of tank and fuel specified. Check hoses and valve connections often. Do this by pouring soapy water on the connection points. If bubbles appear, retighten the connections and test again. Transfer and store liquid propane cylinders in an upright position and never where temperatures can reach 125 degrees. Whether your grill lights by match or push button igniter, always follow the manufacturer’s instructions. 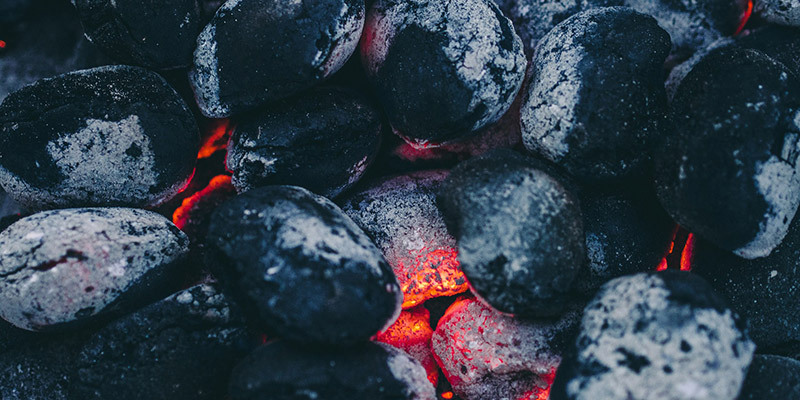 If using standard charcoal briquettes: Stack standard briquettes in a pyramid to allow air to circulate around them, causing them to light faster. Apply “Barbeque” lighter fluid before lighting. Wait at least one minute before lighting to allow the lighter fluid to soak in. Never add fluid to the coals once they’ve been lit. If using instant-light briquettes: Spread briquettes into a single layer, making sure they touch at the edges. Light several of them at their edges with a match. Read the instructions. When cooking has been completed, hot coals will be quenched with water or covered with a noncombustible cover until cold. Charcoal will be properly stored in locations that are dry.